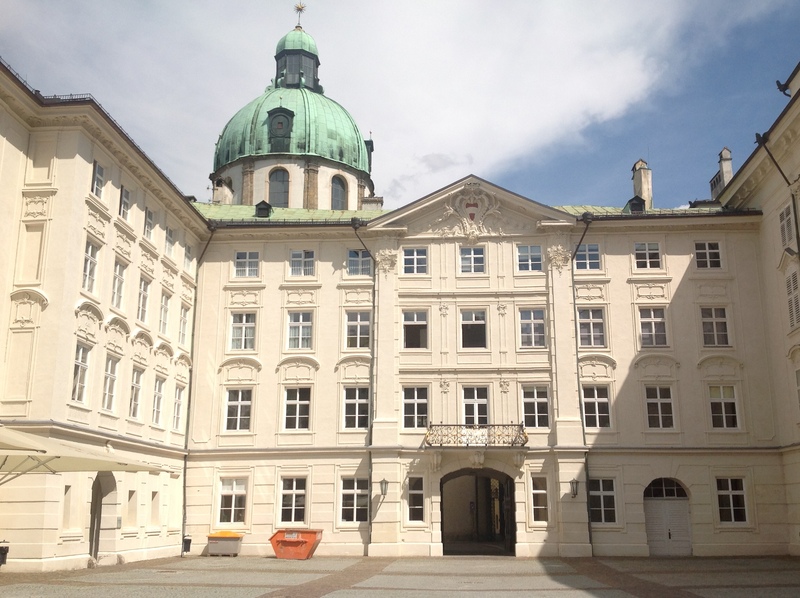 I have just attended the 16th International Conference on Geometry and Graphics, hosted this year in Innsbruck by Manfred Husty, Hans-Peter Schroeker and their team. It was a resounding success, and I had a great time, meeting new friends, from Mexico, Columbia, Russia, Serbia, Germany and elsewhere, and also old friends from here in Austria, Canada, Germany and Croatia. I gave a talk on work with my former student Ali Alkhaldi on the parabola in hyperbolic geometry, and canonical points associated to it, including our discovery of the fascinating Y-conic. Also on my mind is a paper on Incenter circles with my student Nguyen Le that I need to finish correcting for the illustrious journal KoG. 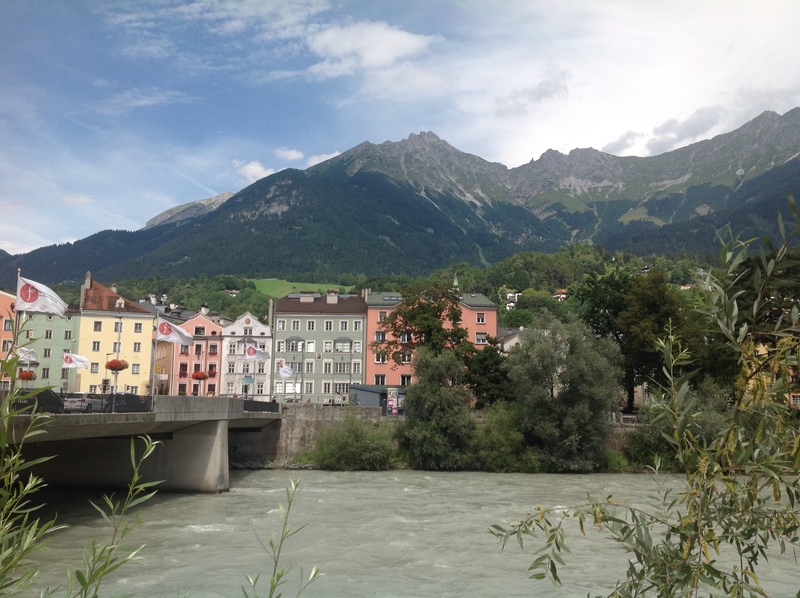 I might tell you about that paper next time: in the meantime here are a few more pics of Innsbruck, whose German name means Bridge over the Inn (river). The Inn valley hugs the city from both sides, with outdoor activities, winter and summer, in the mountains directly accessible. 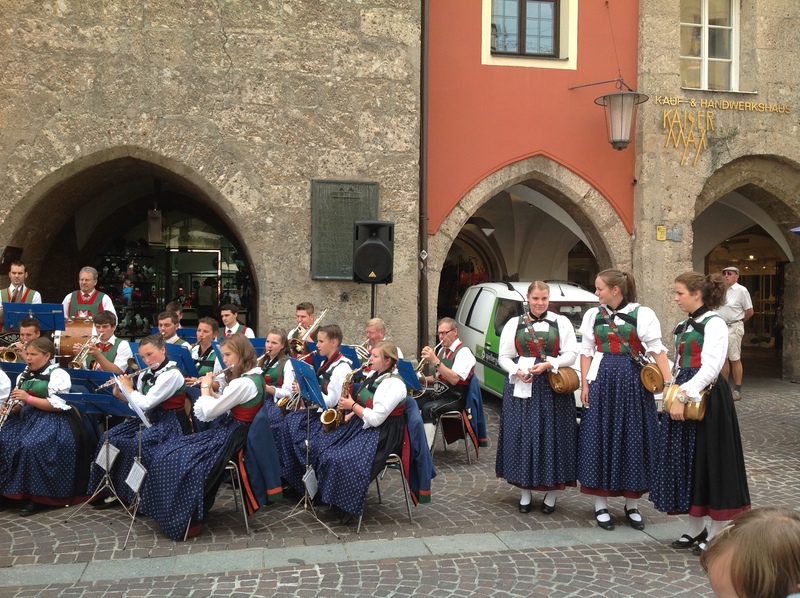 Austrians who live here definitely stay fit! The old town has charm and character, and of course lots of tourists! Coming from Canada, and from Australia, it is interesting to imagine the pyschology of living in a city with such an august and established heritage; with the works of the ancestors constantly in view, and tradition playing much more of a role than where I come from. While the majority no doubt are strengthened and supported by the solidity and presence of that history, perhaps others feel confined by it? Since my father is from Austria, I feel very comfortable in this country, and always enjoy my time here. The mountains are great, and on a nice summer day walking in the alpine countryside and forests, with grand vistas around, can’t be beat. This entry was posted in Uncategorized on August 11, 2014 by njwildberger: tangential thoughts. Sounds awesome! Did you get to present on Rational Trigonometry? Yes, sort of. I talked about applications of RT to hyperbolic geometry, and in particular some beautiful results on how to think about the parabola in this geometry obtained with my student Ali Alkhaldi. I just wanted to share an interesting experience that happened before I heard of your work and which got me interested in your perspective on rational trigonometry (at least the practical implications of it). Of course as stated I needed an approximate value for sqrt(2). But then I realized that simply by squaring the projections I can get an accurate result!!! I now ran across your ideas of quadrances and spreads and am eager to learn more about it . Thanks for the comment. Indeed there are so many interesting applications of RT to concrete problems, and often you get more insight into what is really going on once you give up the fairy tale of angles and lengths which we can never, or rarely, compute precisely. I would really interested to see how other mathematicians respond to your Y-conic presentation. People were interested. I think they could see that this is a rich source of a lot of new results in hyperbolic geometry!